Complete with straw skirt with a tribal painted face, our jungle witch doctor provides the best in interactive magic. 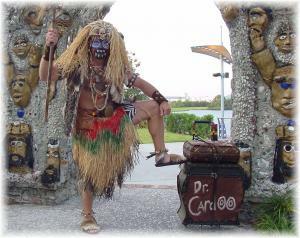 Dr. Cardoo is the perfect greeter for any island themed party as well as a dynamic strolling sleight of hand artist. With his use of tribal magic paraphernalia and flash paper he is guaranteed to cast an enchanting spell on your guests.